Total time of animation. Like, 1000. 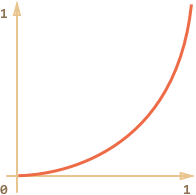 Timing function, like CSS-property transition-timing-function that gets the fraction of time that passed (0 at start, 1 at the end) and returns the animation completion (like y on the Bezier curve). That’s just like transition-timing-function: linear. There are more interesting variants shown below. The function that takes the animation completion state and draws it. 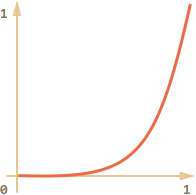 The value progress=0 denotes the beginning animation state, and progress=1 – the end state. This is that function that actually draws out the animation. …Or do anything else, we can animate anything, in any way. Let’s animate the element width from 0 to 100% using our function. Unlike CSS animation, we can make any timing function and any drawing function here. The timing function is not limited by Bezier curves. And draw can go beyond properties, create new elements for like fireworks animation or something. 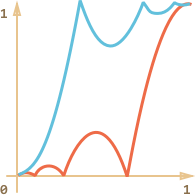 We saw the simplest, linear timing function above. Let’s see more of them. We’ll try movement animations with different timing functions to see how they work. 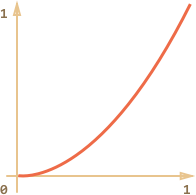 If we want to speed up the animation, we can use progress in the power n.
…Or the cubic curve or event greater n. Increasing the power makes it speed up faster. This function does the “bow shooting”. First we “pull the bowstring”, and then “shoot”. 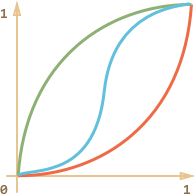 Unlike previous functions, it depends on an additional parameter x, the “elasticity coefficient”. The distance of “bowstring pulling” is defined by it. Imagine we are dropping a ball. It falls down, then bounces back a few times and stops. 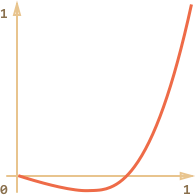 One more “elastic” function that accepts an additional parameter x for the “initial range”. So we have a collection of timing functions. Their direct application is called “easeIn”. Sometimes we need to show the animation in the reverse order. That’s done with the “easeOut” transform. If there’s an animation effect in the beginning, like bouncing – it will be shown at the end. In the graph above the regular bounce has the red color, and the easeOut bounce is blue. Regular bounce – the object bounces at the bottom, then at the end sharply jumps to the top. After easeOut – it first jumps to the top, then bounces there. We also can show the effect both in the beginning and the end of the animation. The transform is called “easeInOut”. 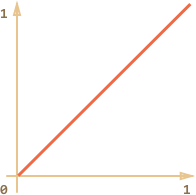 The “easeInOut” transform joins two graphs into one: easeIn (regular) for the first half of the animation and easeOut (reversed) – for the second part. Red is the regular variantof circ (easeIn). As we can see, the graph of the first half of the animation is the scaled down easeIn, and the second half is the scaled down easeOut. As a result, the animation starts and finishes with the same effect. Instead of moving the element we can do something else. All we need is to write the write the proper draw. When a page is in the background, there are no repaints at all, so the callback won’t run: the animation will be suspended and won’t consume resources. That’s great. duration – the total animation time in ms.
timing – the function to calculate animation progress. 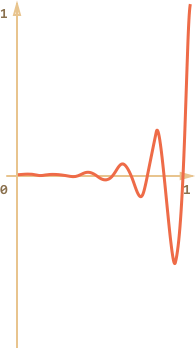 Gets a time fraction from 0 to 1, returns the animation progress, usually from 0 to 1.
draw – the function to draw the animation. The same is about draw: we can animate anything, not just CSS properties. Write the animation code. The distance to the right is 100px.